Paul Gauguin is probably best known for his tempestuous friendship with Vincent Van Gogh in the south of France and his late work in Tahiti. Yet an important influence in his development from bourgeois stockbroker to Post-Impressionist painter was Denmark, of all places. While still working as an art-collecting financier in Paris, he married a Danish woman, Mete Sophie Gad, in 1873. A decade later, he gave up his day job, and the family with five children moved to Copenhagen. Gauguin lived there until he left his wife in 1885 to return to France, painting in Paris, Brittany, the Caribbean and then with Van Gogh in Arles. This Danish connection is the source of a handsome new exhibition at the de Young Museum in San Francisco, “Gauguin: A Spiritual Journey,” organized in partnership with the Ny Carlsberg Glyptotek in Copenhagen. 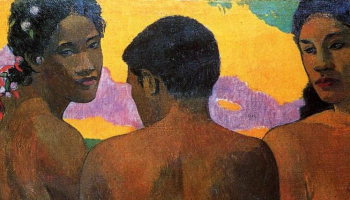 The show traces Gauguin’s transformation from a talented amateur mimicking the work of Impressionists including Pissarro and Degas, who were his early mentors, to the creator of groundbreaking work in the South Pacific. “Figures in a Garden, or the Painter’s Family in a Garden, rue Carcel” is one of Gauguin’s early pictures in the show, completed in 1881 while he was still in Paris. It shows a young woman in a long skirt and hat, possibly Mette, sitting under a spindly tree and minding two small children and a baby in a carriage. In the background is a small courtyard contained by a high wall and a stone building in the background. It’s a subtle mix of tans and browns, greens and yellows, that easily could be mistaken for the work of Renoir. (Gauguin showed more than two dozen works in Impressionist exhibitions in Paris from 1880 to 1882). The paintings from Copenhagen sometimes seem a bit bleak, as if the northern weather has affected Gauguin’s mood. 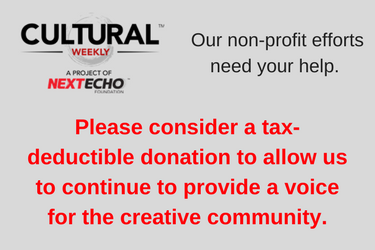 There are skaters on a frozen pond, surrounded by tall bare trees, along with more verdant scenes of parks and empty, tree-lined roads. After his separation from Mette and return to France, Gauguin’s palette seems to brighten. He also starts to experiment with ceramics, making odd-looking brown stoneware that later show the influence of South Pacific sculpture. By the time Gauguin was living in Arles, in the South of France, his work begins to display the more expressionistic, abstract character of his most famous late work. 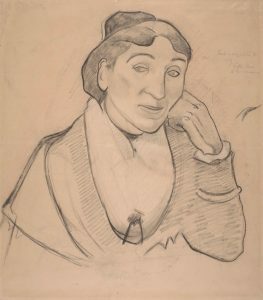 The 1888 pencil drawing The Woman From Arles, Madam Ginoux is a study for a later oil portrait of the owner of a cafe in Arles. (Both the woman and the night cafe also appear in Van Gogh’s work). Dressed in a shawl-like coat and leaning her head against her upraised left hand, Madam Ginoux is perfectly captured with a few confident lines and light shading on the paper. Eyebrows raised, she seems slightly amused by the artist’s attentions. 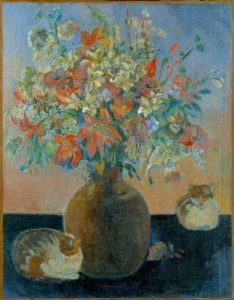 Even a still life such as Flowers and Cats of 1899 shows Gauguin’s development. 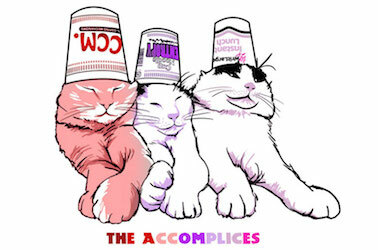 While the vase of colorful flowers could have been painted 15 years earlier, the crouching cats add a spooky element that raises the picture above the ordinary. Organized chronologically, the exhibition saves the best for last, with strikingly modern pictures that show how far he traveled artistically. Reclining Tahitian Women of 1894 (top image) features bold, flat colors, strong outlines of the languid young women, and a rather menacing-looking Tahitian sculpture of a warrior in the background (or is that Gauguin himself, gone native?). 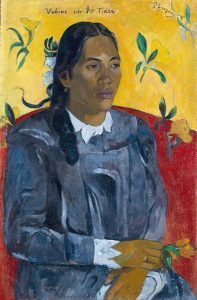 The artist transforms what could be a conventional portrait, Tahitian Woman With a Flower of 1891, with the same use of intense colors and rampant decoration. The subject’s blue and white dress pops off the deep red and yellow background dotted with floral designs. With her arms crossed, she holds a flower in her right hand, echoing the serene portraits of Renaissance masters. It’s the signature image of the exhibition, and for good reason. 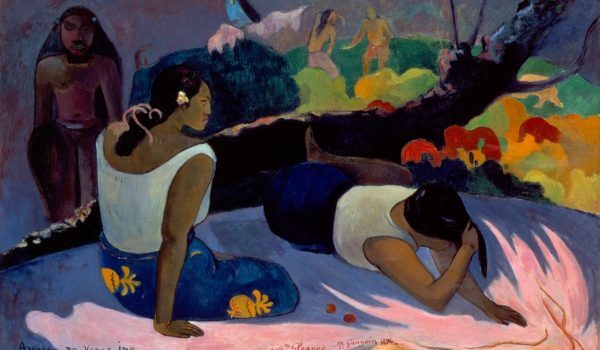 “Gauguin: A Spiritual Journey” runs through April 7 at the de Young Museum in Golden Gate Park, San Francisco, and then travels to the Ny Carlsberg Glyptotek in Copenhagen in 2020. A catalog is published by the Fine Arts Museums of San Francisco and DelMonico Books-Prestel. Top image: Paul Gauguin, “Reclining Tahitian Women,” 1894, oil on canvas, Ny Carlsberg Glyptotek, Copenhagen. All photographs by Ole Haupt (c) Ny Carlsberg Glyptotek.